Rhonda F. Waters, Ph.D., Barbara F. Shambaugh, Ed.D., John C. Sienrukos, Ph.D. The style of leadership in an interdisciplinary collaboration is an existing gap in collaborative literature. Studying the leaders in an existing interdisciplinary collaboration provided a description of the leadership style of the collaborative leaders of three behavioral health teams in New York City. 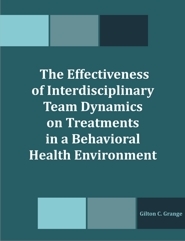 This qualitative phenomenological study used structured interviews of interdisciplinary disciplines to describe the leadership style of the collaborative leaders within a team environment. The data collection and analysis were conducted using codes to identify dominant themes. The themes presented perceptions and experiences of three teams interacting collaboratively. The coding process identified five major themes that are unique components of leadership that suggests new methods of building collaborative leadership within the interdisciplinary team dynamics. Dr. Gilton C. Grange holds a Doctor of Health Administration (DHA) degree. He has extensive experience in the health care arena and currently has concentrated his efforts in grant writing and grant development for organizations who seek to grow their business. Dr. Grange's company, BridgeBuilder Consortium, provides services in proposal writing, management and costing for firms and organizations bidding on government contracts and grants. His areas of expertise are: Grants Management; Organization Development; Coalition and Partnership Building; Research and Outcome Evaluation; Curriculum and Training Development; Career Coaching; Peer Review; Fundraising; Leadership Development; Seminar and Workshop Facilitation.